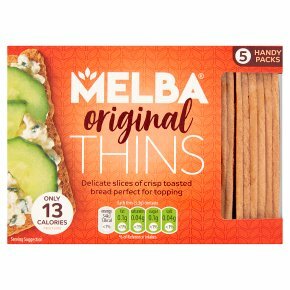 Delicate slices of crisp toasted bread perfect for topping. Only 13 calories per thin. Oven baked with no artificial ingredients. Individually wrapped packs for freshness. Source of fibre. Vegetarian. Why not try... Cottage Cheese, Chives & Cucumber Healthy In-between Snack 1. Mix 2 tbsp plain cottage cheese with chopped chives. 2. Spread the mix over the Original Thin. Slice the cucumber thinly and place on top. or Peanut Butter, Banana & Honey Indulgent Sweet Treat 1. Spread an Original Thin with peanut butter. 2. Finely slice a banana and place the slices on top. Finish with a drizzle of honey and a sprinkle of granola.